Potluck time: Tom takes the cake. My mom jokes with me about the number of potlucks I attend. She’s right, it’s the way of my people. Islanders are a social lot by nature and food is always in the mix. Yep, potlucks are the new normal. Folks around here always (or at least nine times out of 10) respond to dinner invitations by asking, “What can I bring?” The rare instances when the host says, “nothing, just yourself” I worry that my culinary skills are in question. Maybe the cranberry-quinoa-curry salad was not as delicious as I thought, or perhaps the Captain Crunch encrusted jalapeño poppers were a bit too experimental, or was my pumpkin turmeric hummus dip reminiscent of something less appetizing? When I’m invited to dinner, I follow island protocol and ask, “What can I bring.” If there is any hesitation in the host’s voice, I chirp in, “How about dessert?” My greatest fear of being invited to a potluck is being asked to make a salad. One look at me, and you know this man is not about leafy greens. Don’t get me wrong; I love salads, but just like it better when someone else makes them. Desserts are my domain: fruits, chocolate, sugar, crusts, cookies, dough, pie, cakes, slumps, pandowdies, crisps, puddings, buckles and pies. I am an equal opportunity baker. Last night I enjoyed a lovely dinner at my friend Mary Ann’s home in Seattle, and I volunteered to bring dessert. While I pried myself off of the island, Mary Ann did all the heavy lifting with soup, pasta and soufflé. Even my buddies Mark and Doug picked me on the ferry dock, so I didn’t have to drive onto the ferry. As we say around here, I was a walk-on. Yep just a man with a cake tin, on a mission to cross the sound, dine and laugh with friends and pay the Washington State Ferry System five dollars for the privilege of making it all happen. Here’s how it went down. My house is about a ten-minute drive to the north-end ferry. When you are a ferry walk-on, you park your vehicle in the upper lot, way up the hill–a hill that makes Machu Picchu look like a beach dune. Even first-time cyclists to Vashon pause and pray before taking on the hill. So I parked, bundled up, and trundled down the hill, vintage cake tin in hand. As I quickly unwrapped myself, removing jacket, sweater, scarf and cap, I could see my cake tin was a curious sight for most onboard. May I just say, anyone who needs to make friends and meet people should carry a cake tin with them at all times. The twenty-minute crossing became my little cooking show and coffee klatch, sharing the apple cake recipe with the interested, listening to home-baked stories as delicious as any doughy confection. And yes, I also apologized profusely for not being able to share the cake on the spot, but Miss Manners would not approve of presenting a half-eaten cake to one’s host. Short days, early sunsets over the Olympics. After dinner, I tried to leave the remaining cake with Mary Ann, Doug and Mark, but we all knew a cake left over is a cake quickly eaten. Willpower (for them, not me) prevailed, and I returned the half moon of a cake to its copper cradle and headed back to the island. Doug and Mark dropped me off at the ferry terminal and my dock walk deja vu began. Ferry workers commented, parked drivers joked, “hey, we’ll drive that home for you.” Once in the stark waiting room all eyes were on the cake caddy, but not a word was spoken. Apple cake: dessert du jour. Sorry, not a crumb left. Tackling the vertical climb back to my truck baby step by baby step, pausing to gasp for air like a sherpa at base camp, I finally reached my truck. I may have disembarked with an empty cake tin but I drove home with full heart and warm truck. 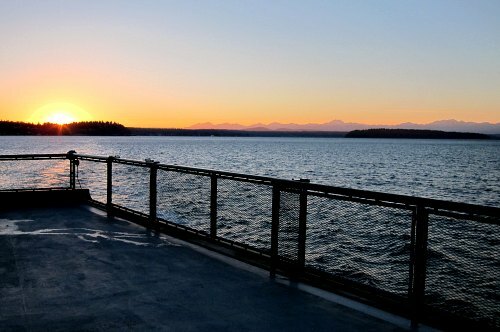 So the moral of the story: The next time you’re feeling lonely, bake a cake, and take a ride on a Washington State ferry. You WILL make new friends. PS- It doesn’t hurt to have an awesome standout vintage copper cake caddy. (Mine was a surprise gift from friends Sheila and Berneta). Great tale shared and I love your cake tin ~ not to mention the other images! Bread, cake and all things ‘bake’ from my hands to be shared are my chose path too. Dying to ask, what is/are “pandowdies”?!? Thanks for a lovely read…. Tom, I honestly believe, somewhere back in my lifetime, I had the exact cake tin. Many, many moves have eliminated it from my inventory. However, I would have been right by your side on the ride over and the ride back. I am thinking the ride back would have been the best part of the trip!! I don’t suppose that ferry would make it around Mexico, through the Gulf and to my house? Ya, didn’t think so. You know, that maybe my former cake tin – I left one just like it behind in a flurry of downsizing when I moved from Juneau, AK to Western Washington. If that’s it I am glad it has a good home. I swear to the Apple Gods, your writings cause me to contemplate a move from sunny floreeeda,to the the misty mountains of washeeengton! Miss and love you friend! That is so sweet of you to suggest you volunteered to bring the cake, Tom. Actually, we all insisted on it. Happy that our gustatorial delight provided you with an entree into social discourse, you’re usually so shy. Oh Mary Ann, I’m still dreaming about that ginger-carrot soup, soufflé and mushroom Stroganoff. The only thing that matched dinner was the conversation and company. Thank YOU! 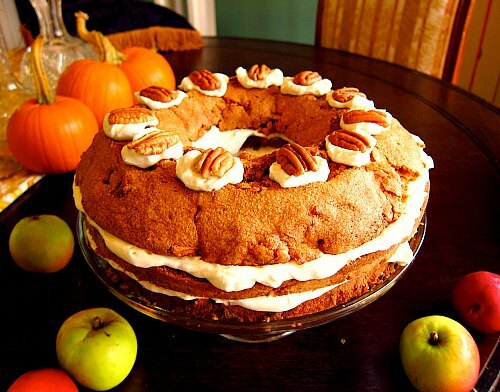 Great story about your travels with the apple cake. 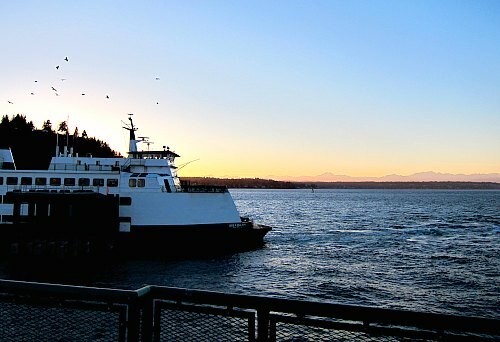 I was afraid there would be an unfortunate accident when the ferry lurched, the cake flew out of your hands, over the rail and into the Sound….well, so glad it turned out to be a lovely evening all around! 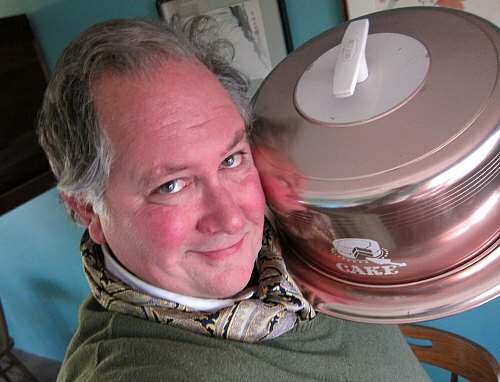 Love the picture of you sporting the cake tin. It looks good on you. Wonderful Tom! Same thing happens here on Anderson Island. Our little ferry (County) crew is often the recipient of potluck leftovers. Common for someone to just bundle things up, drive down to the dock and walk them to the boat. And I will definitely be trying the recipe, still have some Jonathans in the fridge that need to be used. 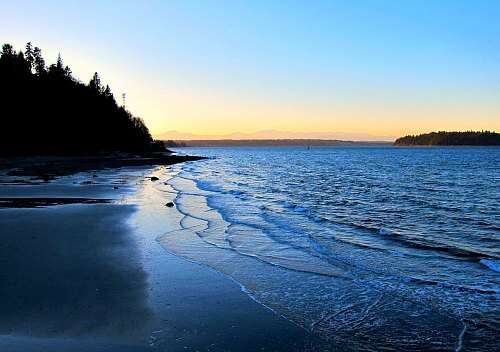 Sandi, I love Anderson Island. I used to visit my friend Nancy and her family there on Oro Bay. The ferry crew on that route is exceptionally kind and friendly. Let me know if you like the cake recipe. Very fun! You make me wish I was back in more friendly and stable environment; I agree, cake is to be shared. I was just thinking of all the begging kids (refugees from Syria most of them) who’d devour your cake. Joumana, your comment is a poignant reminder to me of how very fortunate I am. May I never take for granted such elemental things as shelter, water and food, not to mention the good fortune of a loving family and friends, a community that cares, a stable government, and access to art, education and learning resources. Joumana are you living full time in Beirut now? Safe travels, and well wishes to you and your family. First of all, that is a really beautiful, and I’m certain delicious, cake! And I loved the story. It’s true — bake a cake and everyone’s your friend, but the addition a ferry ride with a vintage cake tin makes the events that evening all the more endearing. That was the BEST story! Thanks! Beautiful photos, hilarious and heart-warming story ! Especially could relate to climbing up to the parking lot “like a sherpa at base camp”. Loved it !!!! Thank you for the evocative story. Lots of images of late night ferry rides and island culture. And that return trip- so sweet to step onto the dock and think, “home”. Just had a rally last weekend on Salt Spring Island to halt the proposed tanker traffic assault on the Salish Sea. From sweet to soul-searing. Sandra, you’d think it would take just one ferry ride to Salt Spring Island or any of the Gulf Islands to sway a decision that would have an ill effect on your rare and beautiful archipelago. May wise heads and sound leadership protect your island paradise. Introverts keep all the cake for themselves!